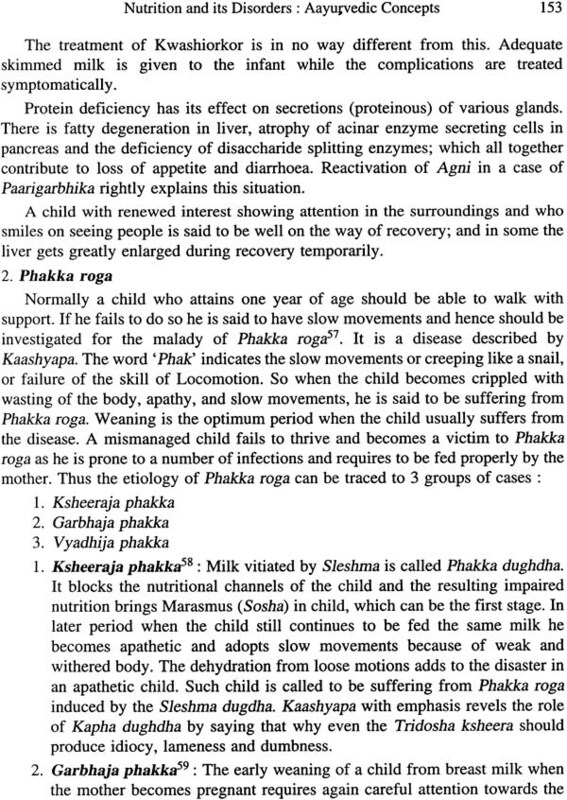 The subject of Paediatrics in Aayurveda is classified in the light of relevant modern advances. Both traditional and textual principles of paediatrics are explained hypothetically. The matter is supplemented with multiple flowcharts and tables which are liberally sprinkled throughout the book to make the subject understandable at a glance. The benefits of modern medicine and Ayurveda are to reach the common man by proper integrated approach. This book is a step forward in this direction. The book will be useful to postgraduate students of Aayurveda. Postgraduate student of modern paediatrics who intend to have an integrated approach towards the subject, undergraduate students of Aayurveda and also the practitioners of Aayurveds. Dr. CHS Sastry: Born on 14th February 1942, Dr CHS Sastry was always a topper in Integrated Medicine from Govt Ayu College, Hyderabad, Andhra Pradesh. He obtained his Doctorate degree from BHU in Balaroga (Ay). He served in top positions like Professor, Kaumarabhritya, IPGT&RA; Director, NIA, Jaipur; Director, ISM&H, NCT, Delhi; Director CCRAS and Advisor (Ayurveda), Govt of India. He loves teaching and has an aptitude for research. During his long career he guided more than 100 PG students in Kaumarabhritya. He presented papers both within and outside the country. Dr. Krishnadutt Chavali. A postgraduate in Forensic Medicine & Toxicology with an MD, DNB and a PGDHA to his credit, has an experience of serving at different government medical college of Gujarat, Govt Medical College, Chandigarh and currently at the All India Institute of Medical Science, Raipur, Chattisgarh. He is Additional Professor in Forensic Medicine & Toxicology at AIIMS, Raipur. He has coauthored a book on Forensic Medicine and has many papers published in national and international journals. Dr. Anita Gayatri: is a postgraduate in Dravyaguna with deep insight on drugs used in paediatric practice. She worked as Lecturer and then as Reader and practitioner at Dhanwantry Ayurvedic College, Chandigarh from 2008 to 2014. Currently, she is working as Senior Medical Officer (Ayurveda) at All India Institute of Medical Sciences, Raipur, Chattisgarh. Dr. Viswanath Chavali. a postgraduate in Orthopaedics, is an alumnus of Medical College, Baroda. He is currently working as Associate Professor in Orthopaedics at Medical College, Broda. He is also the Dean of Student Affairs of the college and has keen interest in teaching and patient care. He has authored papers in national and international journals. Paediatrics as a distinct speciality is a child of late twentieth century. Earlier its one offshoot i.e. neonatology was dealt by obstetricians and paediatrics as such was under the domain of general physicians. Now neonatologists are encroaching upon domain of obstetricians with the analogy that the diet and drugs etc. used by expectant mother positively influence mental and physical growth and development of growing foetus. The psychophysiological requirements of adolescents are different from a child and naturally this group of population requires specialized attention, for which adolescent clinics are coming up specially in developed countries. 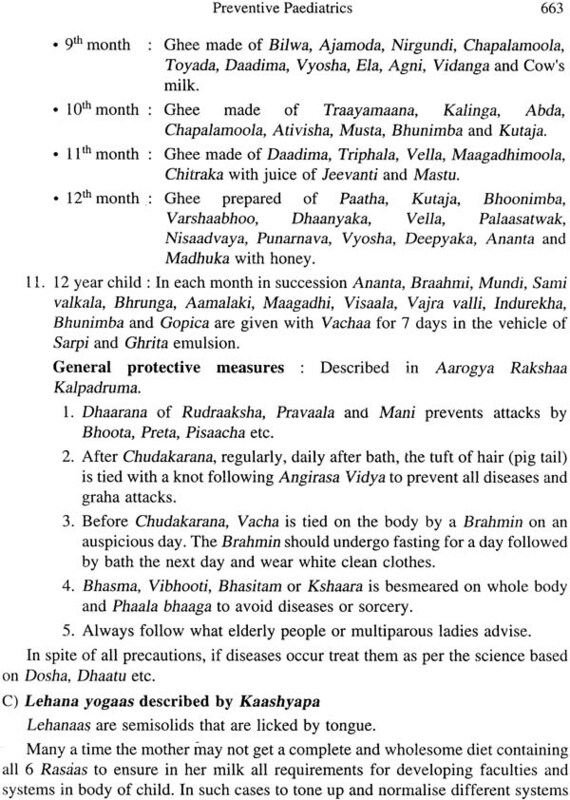 Ancient seers of ayurveda thousands of years back described 'Kaumarbhrtya' as one of the speciality encompassing in itself entire physiopathologies of female reproductive system, pr-epregnancy health of couple, then from conception up to sixteen years of age of the child in order to provide excellent human being for the society. This shows the wisdom and foresightedness of these sages. Ayurveda is said to have originated from vedas specially atharvaveda. However Kasyapa accepts it to be fifth veda more dominant and important than other four vedas and has compared ayurveda with thumb and other four vedas as four fingers of the palm. His analogy is that the man of only healthy body and mind can study, understand and implement the principles laid down in these books and it is ayurveda which takes care of mental and physical health from the period of individuals conception to later life. Though vedic medicine is mainly magico-religeous, sufficient material of ayurveda including paediatrics is found in these compendiums. From Vedas come samhitas, which give more intelligible and practicable description of all subjects. In these classics principles in general are mentioned which are applicable to entire human population, be a neonate or old person. To-day's scholars do not get contented by studying only scriptures, rather they want scientific, intelligible and applicable explanation for all subjects. In ayurvedic classics subject of to-day's accepted topics are scattered in whole classic, and at times views of all major classics have to be read, understood and explained, only then the topic becomes intelligible. In other words almost all important ayurvedic classics have to be studied in their entirety, relevant points are to be collected, interpretted and explained. The task is actually a herculean; moreover CCIM, the governing body of ayurvedic education often revises the syllabus, thus the book written on the basis of earlier syllabus does not serve the purpose of later students. Apparently it seems that all the physiopathologies of paediatrics are not found in classics. Certain new diseases non-existent earlier have emerged. All such conditions are to be explained to novices and even their teachers in intelligible manner. This verse provides the basis of diagnosis and treatment of sizeable paediatric ailments, but an erudite has to explain in relation to paediatrics, not seen in the compendium. As diseases do not manifest without involvement of doses, and even if those are not described, the disease is to be treated on the basis of clinical features. These principles are to be applied by an erudite to newly emerging diseases and treatment advised. There exists sizeable other difficulties before an ayurvedic pediatrician in academic and practical field. The book "Chavali's Principles and Practice of Paediatrics in Ayurveda" has come up as a boon to the scholars of ayutvedic paediatrics. Probably this is the first book of paediatrics describing almost entire garnet of paediatrics including neonatology of current modem medical literature vis-a-vis entire ayurvedic subject, and presenting both these subjects in concurrent descriptions. This concurrent procedure provides golden opportunity to study the subject of both the systems and develop faith in ayutveda realising that most ancient medical science, that is ayurveda did not lag behind the present concepts, albeit, writers have to pickup the beads scattered in entire text, not one but almost from all classics and then put together in proper order. Tables, flow-charts and diagrams make easy and deep impact in mind specially in young readers as the subject becomes more intelligible, which have been liberally given in this book. One flow-chart also paves the way to every individual to know his/ her own psychosomatic constitution. Presentation of subject matter is planned in a way to make it more intelligible. The book is divided into thirty seven chapters. After introducing the subject in first chapter subsequent four chapters are devoted for basic subjects, before touching exact paediatrics. Though genetics etc. included in these four chapters are mentioned in classics, they are referred to in other context. The book brings them at one place with a leaning towards implementing all these in relation to paediatrics. Seventh' to nineth chapters start from birth of neonate; then advancing to all physiopathologies and care as-well-as management. Concept of pre-term and post-term neonate from ayutvedic point of view is very appreciable. various samskaras vis-a-vis growth and development throw a new light on the subject. 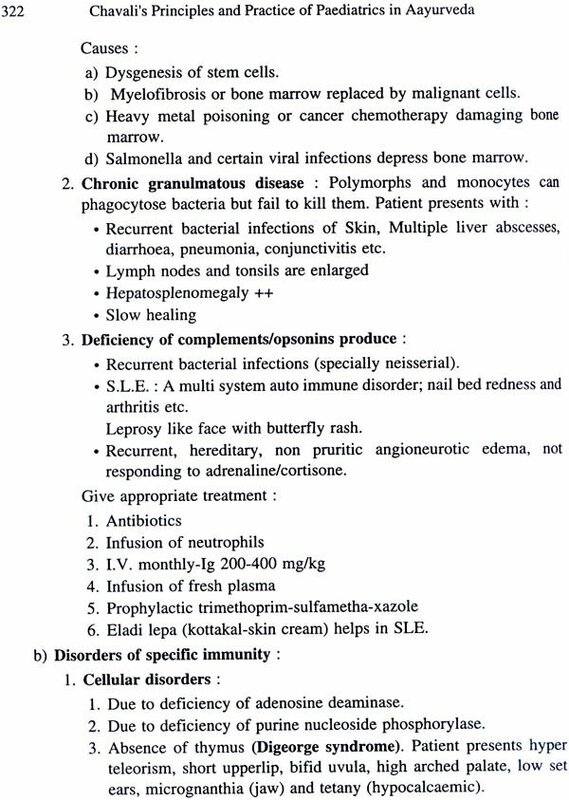 Immunity and allergy are very important in todays health scenario, and are discussed in chapter ten which follows the infective diseases including grahas. 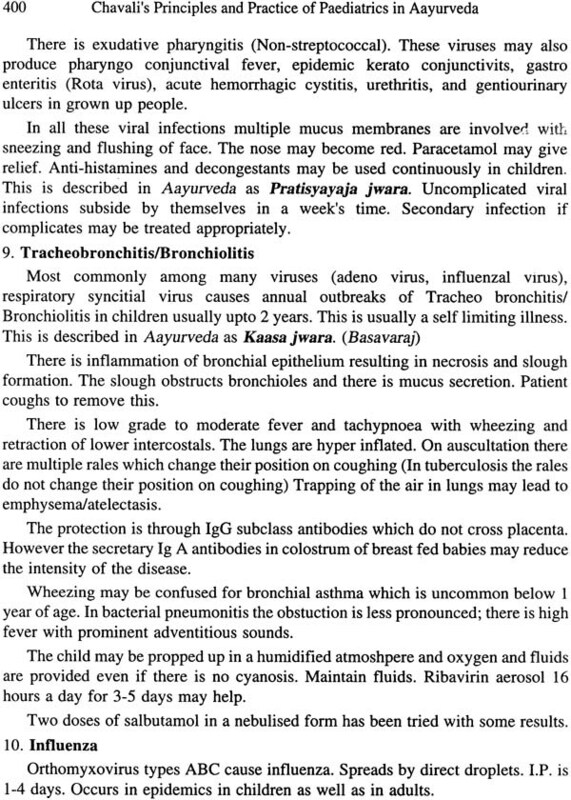 For the first time this book of paediatrics has described Jatahiirif.1ls amongst the biilagrahas which is very important. 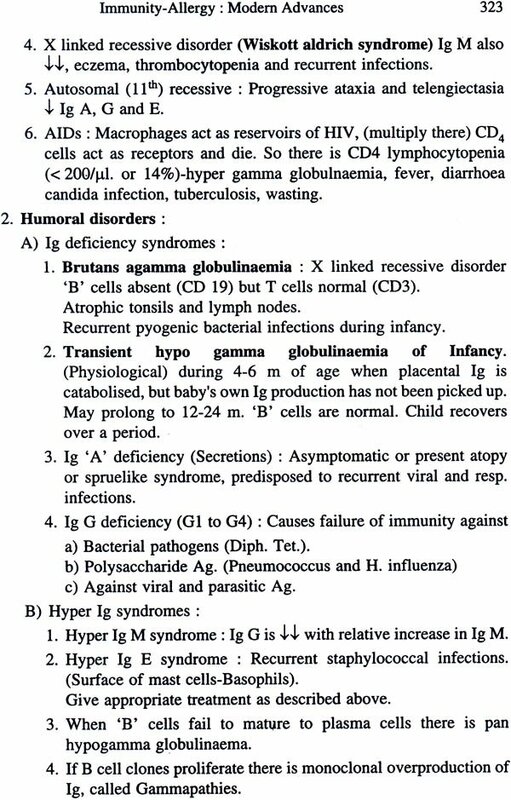 In chapter twelve to twenty four and twenty six and twenty seven, general disorders are discussed. 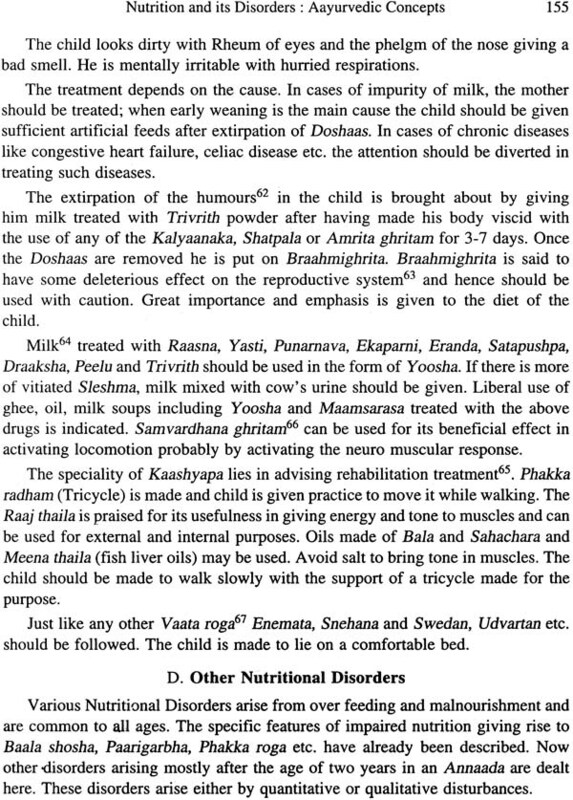 These ailments though very important, yet are not described in ayutvedic classics in relation to paediatrics, have been elaborated on the basis of doctrine advocated by Caraka mentioned earlier. Chapter twenty-five is devoted to those peculiar ailments inflicting exclusively an infant not covered by general doctrine but having specific aeteopathogenesis. After describing therapeutic principles and specific procedures suitable for paediatric age the book advances again towards diseases (chapter 31st) and describes benign and malignant new growths. 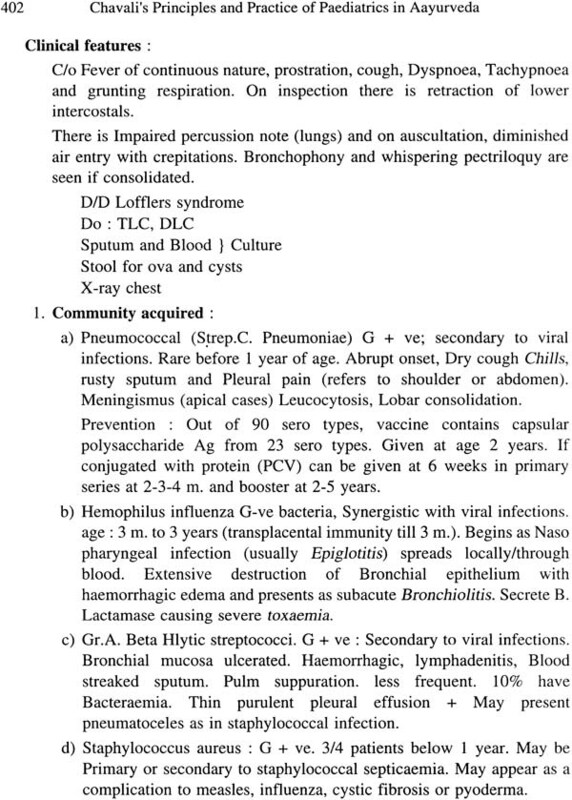 To include apacT and gaf.1cjarniila in this reference needs reconsideration. For surgical ailments though principles are given in classics, yet exact procedures have to be learnt from current system. Last six chapters are very much in tune with current health programmes. Textual references appended at the end of every chapter make it easy for reader to see what words are actually given by the sages. Description of complete modem paediatrics on one hand becomes useful for a novice of modem paediatrics to refer the book particularly during examination days, on the other hand to senior paediatricians interested to know ancient heritage in relation to modem paediatric practice. Description of such a vast subject without missing even a single point in very concise and intelligible manner justifies the idiom "Gagara men sagara". I congratulate Dr. C.H.S. Shastri and his team for doing such a great service to ayurvede and hope and wish that more works of this or even higher standard would be brought by the team. Kaumaarabhritya, the most evolved science is one among the Astaangas of Aayurveda. It comprises of 'Kaumaara Bharana and Poshana' which helps the child to grow into a healthy individual. Kaashyapa Samhita is an authoritative treatise of Kaumaarabhritya which is not available in its full form today. The walking Kaashyapa of the era, Prof. C.H.S. Sastry, pioneer in the field of Aayurveda with his immense knowledge and vast clinical and research experience has incorporated his ideas in his doctorate research. It is indeed immense pleasure to bring his research in the form of a book entitled 'Chavali's Principles and Practice of Paediatrics in Aayurvea'. I am very happy that this book is being published by the Publicaiton cell of S.D.M. College of Ayurveda, Hassan and is being released on the occasion of National Seminar on Kaumaarabhritya 'Kaumaara-2006'. This book comprises of various information regarding theoretical and Practical knowledge concerned to Kaumaarabhritya. Samskaaras and Graharogas are enlightened well with a practical approach. Greater comparison is made with the contemporary Sciences. 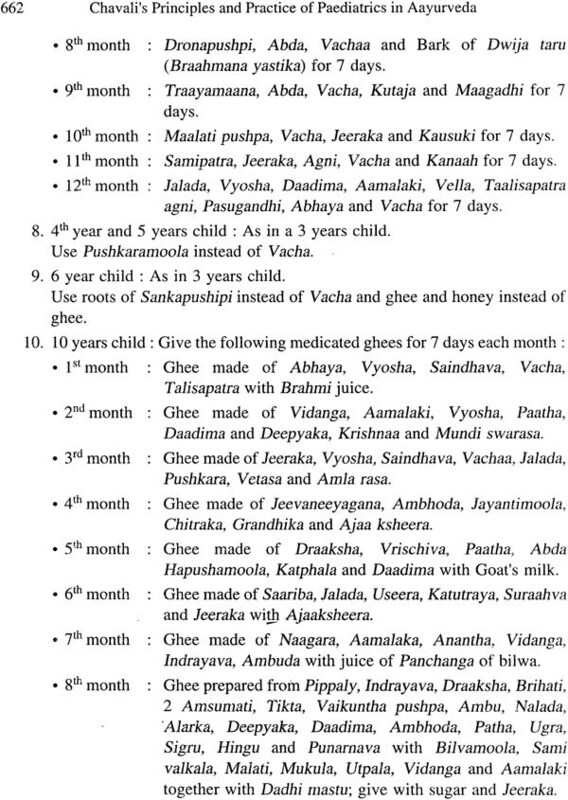 The book has come out as a Geetha in the filed of Aayurvedic Paediatrics. Written in simple language, the book will surely benefit the Undergraduates, Postgraduates, Teachers and Practitioners of Kumaarabhritya. Renaissance of Aayurveda was started along with the independence movement. After independence, Government of India appointed various committees like Mudaliyar committee, Udupa committee etc. to recommend on teaching and regulating Aayurveda. From time to time these committees and also the CCIM recommend enrichment of Aayurveda by integrating it with modem advances. Real integration has not been done so far and no such books are available. Many colleges still follow teaching Aayurveda in an orthodox way by following Samhitas. Attempt of this book is a beginning in such integration. Lord Ganesh and Kashi Viswanath inspired us with flow of ideas. We are very much thankful to almighty and pray for such divine grace consistantly showering on us. We are very much grateful to late Dr. Chandan Chaturvedi and Dr. P.V. Tewari for giving deep insight into the subject and constant support and encouragement. As far as possible the terminology used in Aayurveda texts is followed without translating. Only relevant basic modem advances are given in each topic along with Aayurvedic concepts. The Aayurvedic concepts without being distorted are classified and presented along with few folklore claims and traditional practices. Hypothetical postulations are given here and there by taking help from modem advances to understand Aayurveda and these are subject to changes when proved otherwise. Attention is kept in bringing Aayurveda for better practical utilisation wherever possible. Readers are advised to refer to modem text books wherever necessary, specially for modem drugs and their dosage. Various charts and tables are drawn for easy understanding at a glance. Repetitions are present at few places because of similar topics from Aayurveda and Modem systems and these are only to create more emphasis to the reader. All chapters relating to child health and care including genetics, embryology, neonatology, nutrition, body fluids, infant feeding, immunisation, psychological development and disorders, growth and development, etc. have been revised and elaborated. A clinical approach for some topics like fever is attempted and this, we believe, shall pave way for bringing more clarity in Aayurveda and generate interest to the reader in understanding the disease and in selecting appropriate drugs and therapeutic principles. 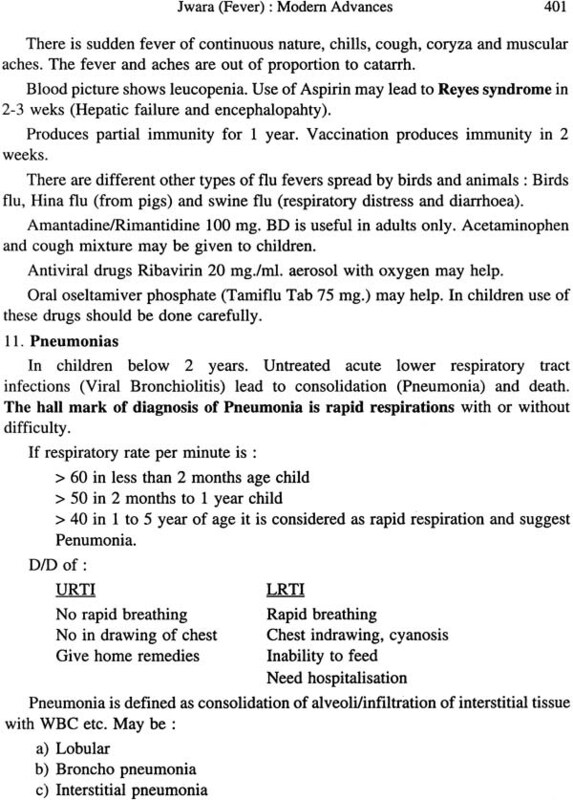 Some common disorders relevant to Kaaya chikitsa and Baala roga as well, have been presented; wherever possible, the different picture as we find in paediatric practice is given. Instead of complete sentences, here and there some phrases are used to make the subject short and for easy memorisation. The first edition of this book was the Ph.D. thesis of Dr. C.H.S. Sastry at BHU in 1976 and was published by SDM College of Ayurveda, Hassan in 2006 with permission from BHU. May God bless those who copied it and published as their own ideas, neither with our knowledge nor even with permission from BHU. To err is human. Inadvertant typographical errors and other mistakes that might have crept in, may kindly be borne with patience. Any corrections or suggestions for improvement in future editions may be sent to Dr. K.D. Chavali of department of P.M., AIIMS, Raipur and we shall be thankful for such suggestions. We acknowledge and thank those who directly or indirectly helped us in a variety of ways in bringing out this edition. Special thanks are to Smt. Bhramaramba wife of C.H.S. Sastry for her persuation in bringing out this edition. Mr. Sunil and Mr. Ashok of Chowkambha Viswabharati need congratulations for neat printing. Aayurveda, the Indian system of medicine as practised 2500 years ago, when the European Nations were a mere riff-raff of savages cannot stand or compete with the western medicine which has well developed in the last few decades. However, many of the concepts or principles laid down in Aayurveda can well be explained in modern outlook and some times it is surprising to find this system of medicine to have an advanced thinking. Really it would have surpassed the western medicine had it not fallen to victimisation for the last many centuries. Aayurveda is the applied philosophy, while the modern medicine is the applied study of pure sciences like Chemistry, Physics etc. 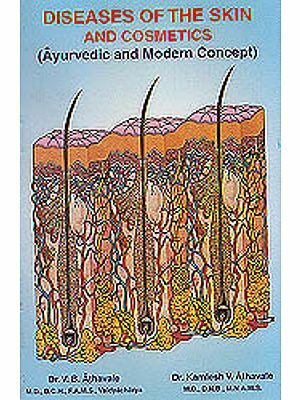 Thus many of the concepts of Aayurveda have an abstract philosophical approach and become difficult to be proved in a test tube. The scattered subject matter of Paediatrics in Aayurveda is gathered from various sources and is rearranged or classified in a sequencial order with a fresh approach in interpretation of various topics in a critical and rational way in the light of modern knowledge. 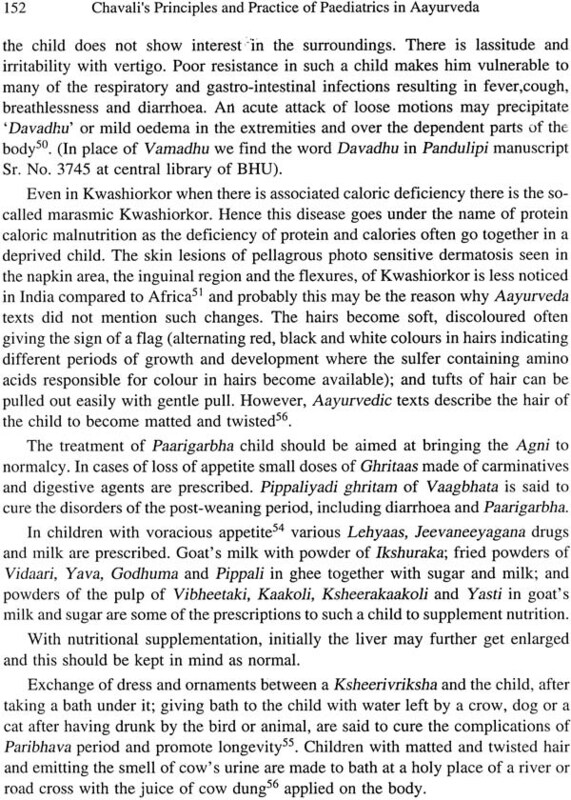 Kaumaarabhritya, one of the Astaangaas of Aayurveda has its recognition as a separate branch of medicine since long with books like Kaashyapa Samhita devoted for the purpose, while in modern medicine it is not until George Armstrong (1770- 89) wrote a book 'An Essay on diseases most fatal to infants' whencefrom the branch of modern paediatrics came into existence. Sheldon and Nelson were the poineers in paediatrics and country wise academies are formed and the subject is fast growing. Kaashyapa rightly gives to this branch of medicine the top importance, as the role of general physician comes into play only when once the zygote is brought to its full maturity. B. Why Paediatrics as a Separate branch? Many have a wrong notion of limited scope of paediatrics. To some it is simply infant feeding. To others it is the management of illness of first 2-3 years. Still to others it is practice of preventive medicine and immunisation. To some it is management of developmental behaviour disorders. Many think erroneously that general medicine and paediatric medicine are not different. In fact, the etiological factors, the pathological changes, the clinical picture and the outcome differ much from general medicine in a growing child. A child, an infant and a new born differ from adults in many ways and it is relatively a challenge for the paediatrician to understand and treat specially as the child cannot explain his symptoms. Individualisation of each child is the essence of child care. 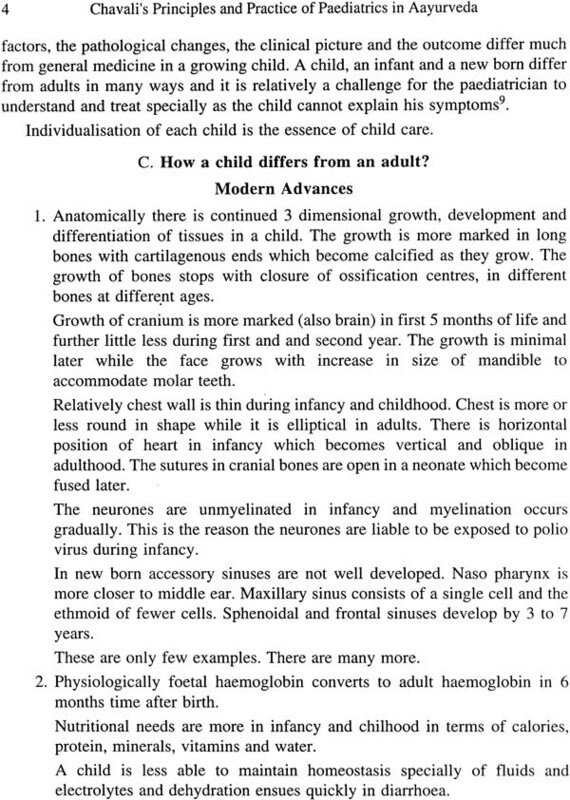 C. How a child differs from an adult? 1. Anatomically there is continued 3 dimensional growth, development and differentiation of tissues in a child. The growth is more marked in long bones with cartilagenous ends which become calcified as they grow. The growth of bones stops with closure of ossification centres, in different bones at different ages. Growth of cranium is more marked (also brain) in first 5 months of life and further little less during first and second year. The growth is minimal later while the face grows with increase in size of mandible to accommodate molar teeth. Relatively chest wall is thin during infancy and childhood. Chest is more or less round in shape while it is elliptical in adults. There is horizontal position of heart in infancy which becomes vertical and oblique in adulthood. The sutures in cranial bones are open in a neonate which become fused later. The neurones are unmyelinated in infancy and myelination occurs gradually. This is the reason the neurones are liable to be exposed to polio virus during infancy. In new born accessory sinuses are not well developed. Naso pharynx is more closer to middle ear. Maxillary sinus consists of a single cell and the ethmoid of fewer cells. Sphenoidal and frontal sinuses develop by 3 to 7 years. These are only few examples. There are many more. 2. Physiologically foetal haemoglobin converts to adult haemoglobin in 6 months time after birth. Nutritional needs are more in infancy and chilhood in terms of calories, protein, minerals, vitamins and water. A child is less able to maintain homeostasis specially of fluids and electrolytes and dehydration ensues quickly in diarrhoea. The breathing of a child is mainly abdominal while it is thoracic in adults. Pulse rate and respiratory rate are higher in new born. They gradually come down by 2 years and then reach that of adult by 18 years. Fasting blood glucose is lower in infants than in adults. 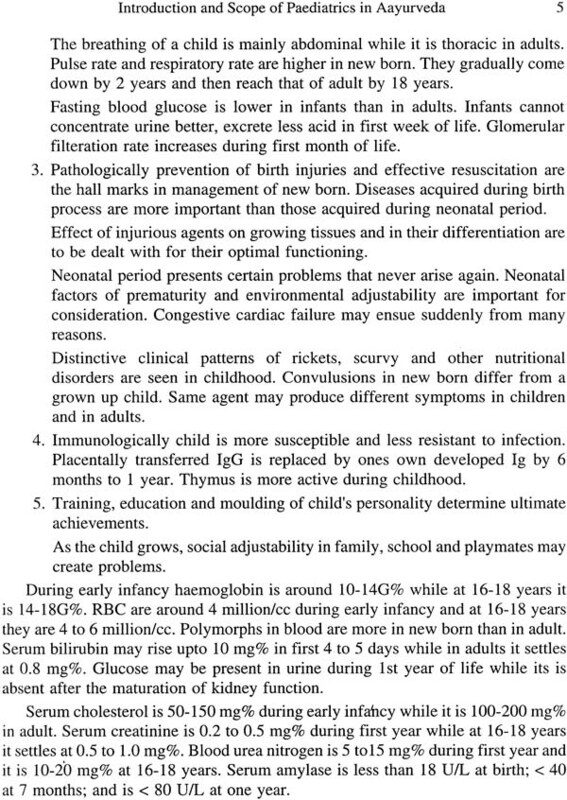 Infants cannot concentrate urine better, excrete less acid in first week of life. Glomerular filteration rate increases during first month of life. 3. Pathologically prevention of birth injuries and effective resuscitation are the hall marks in management of new born. 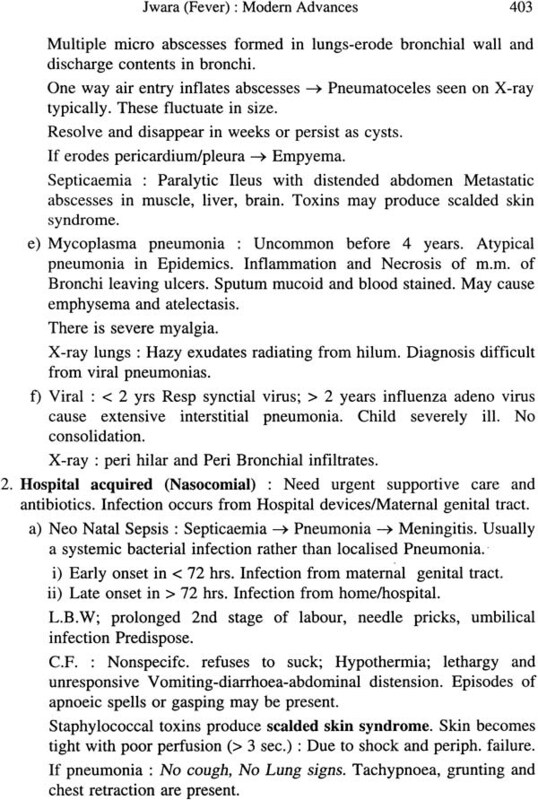 Diseases acquired during birth process are more important than those acquired during neonatal period. Effect of injurious agents on growing tissues and in their differentiation are to be dealt with for their optimal functioning. Neonatal period presents certain problems that never arise again. Neonatal factors of prematurity and environmental adjustability are important for consideration. Congestive cardiac failure may ensue suddenly from many reasons. Distinctive clinical patterns of rickets, scurvy and other nutritional disorders are seen in childhood. Convulusions in new born differ from a grown up child. Same agent may produce different symptoms in children and in adults. 4. Immunologically child is more susceptible and less resistant to infection. Placentally transferred IgG is replaced by ones own developed Ig by 6 months to 1 year. Thymus is more active during childhood. 5. Training, education and moulding of child's personality determine ultimate achievements. As the child grows, social adjustability in family, school and playmates may create problems. During early infancy haemoglobin is around 10-14G% while at 16-18 years it is 14-18G%. RBC are around 4 million/cc during early infancy and at 16-18 years they are 4 to 6 million/cc. Polymorphs in blood are more in new born than in adult. Serum bilirubin may rise upto 10 mg% in first 4 to 5 days while in adults it settles at 0.8 mg%. Glucose may be present in urine during 1st year of life while its is absent after the maturation of kidney function. Serum cholesterol is 50-150 mg% during early infancy while it is 100-200 mg% in adult. Serum creatinine is 0.2 to 0.5 mg% during first year while at 16-18 years it settles at 0.5 to 1.0 mg%. Blood urea nitrogen is 5 to15 mg% during first year and it is 10-20 mg% at 16-18 years. Serum amylase is less than 18 UIL at birth; < 40 at 7 months; and is < 80 UIL at one year. Kaashyapa says that Sukra and Sonita appear in boys and girls at the age of 16. He means probably the appearance of sperms and liberation of ovum (ovulatory cycles) respectively with increasing levels of hormones. The importance of paediatrics lies in the fact that the child has poor resistance, immaturity in growing tissues and systems of the body, which together with Ojus (first 6 months uses transfered ojus from mother; later develops him self) and sense organs continue to grow, develop and differentiate during this period. Hence Dhaatusaara cannot be assessed and one has to depend on intensity of cry for it. Though basic psychae is established it is further subjected to various environmental factors. Though Dhaatu poshana is similar to that of adults, turn over is very rapid, Malaas are less and Sukradhaatu is utilised for cell division and so growth of body. In proportion to a relatively smaller body in children the Doshaas, Dhaatoos (Dooshyaas) and Malaas are also less. Since the Dhaatoos have been developing one cannot decide their status in a child. A child is normally of Sleshma dhaatu predominent. Vaata vyaadhis and Birth injuries are different in children than those of adults. Agni is unstable during Ksheeraannaada. Thus a paediatrician should keep in mind various mile stones of growth and development including the psychological construction, provide optimum nourishment to the growing tissues, and prevent the child from becoming a victim to various diseases to which he is vulnerable. Hence he is more concerned with the upkeep of normal health and nutrition in a child while only in few cases treatment and diseases of children do not differ much from those of adults; but for the alteration in the dosage with mild principles in therapeutics '. The child cannot express different symptoms with which he suffers. The paediatrician has to depend more on the signs elicited on examination and should not make any mistakes. 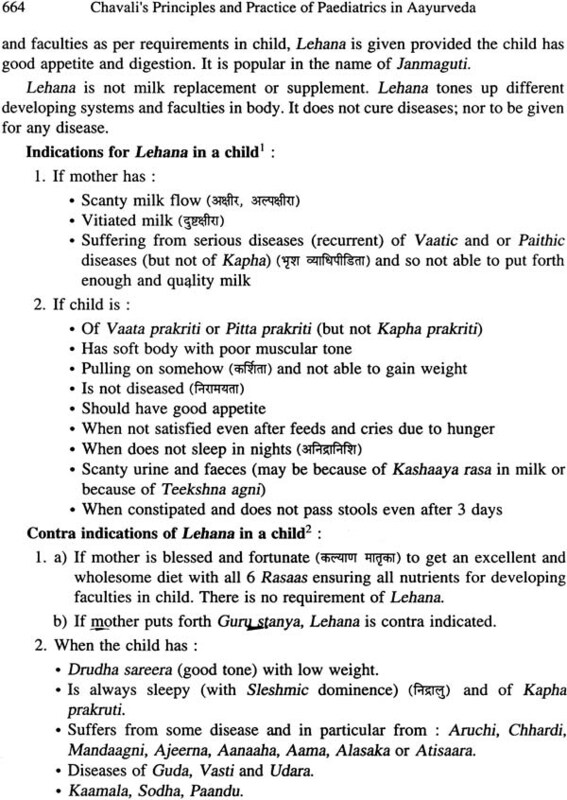 It is a challenge to paediatrician to treat a child without proper assessment of Doshaas. The word Kaumaarabhritya itself denotes the importance of nourishment, support and maintenance of the child (Chakrapani). Care of a child starts with the formation of the zygote and many factors like mother's nutrition, mental state and environmental factors play role in proper growth and development of the foetus. Proper management during delivery including the avoidance of birth injuries, early and effective resuscitation are equally important to a paediatrician, lest, they cause permanent disabilities. Defective nutrition and infections influence the growth and development of the child. Even emotional dissatisfaction is said to be the root of life long personality disorders. In view of all thses things, paediatrics has got a wide range of applicability and Haareeta has correctly defined Kaumaarabhritya as the branch of medicine dealing with the antenatal, natal and post natal care of the child". Care of a zygote formed from defective Shukra and Shonita is useless and hence this branch of medicine has its perview of applicability right from treating the gynaecological problems and Shukra doshaas. 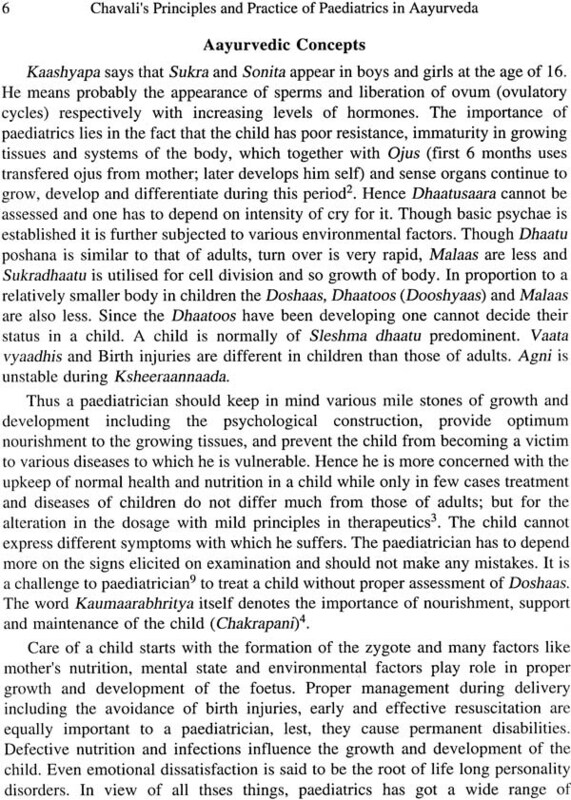 Thus gynaecology, Obstetrics, Child Health and Care including Graharogaas are all described in Sharrera Sthaanaas of various Samhitaas and come under the perview of Kaumaarabhritya (Sushruta) apart from the general medicine. 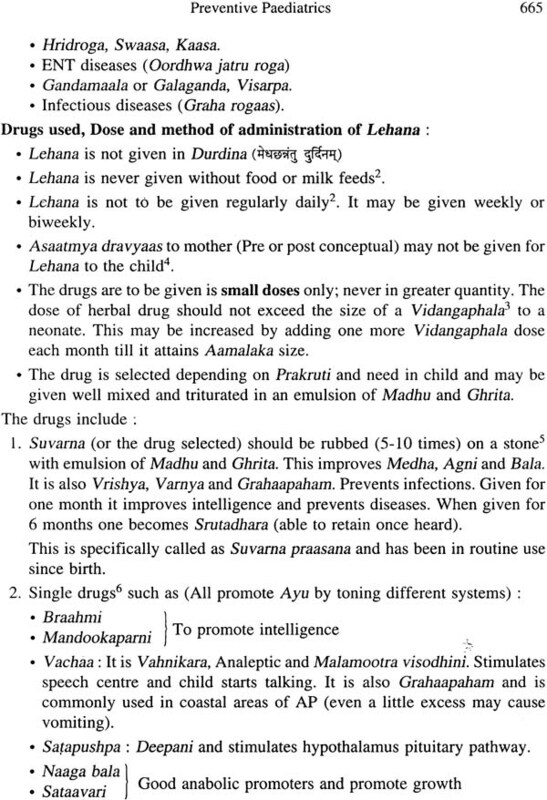 Thus no other branch of medicine has such a wide range of applicability as that of Kaumaraabhritya. A paediatrician needs special training to deal with a child after having studied general medicine.